Considering one of these little stripey numbers. Love all of those stripey numbers!! I'm beginning to wonder if I will ever get over my stripe addiction b/c it just seems to be getting worse and worse when posts like this come up! You know, I have a lot of stripes in my wardrobe but not in my home. I think I need to rectify that immediately . . . these might be just the thing to get me started. I love stripey rugs too! Actually, I love striped anything from shirts to shoes to upholstery fabric. Gorgeous rugs here! I want them all! They look like Peruvian/Bolivian knits. Besos! Seriously please do treat yourself with one of these rugs. IM all about the stripes these days. I just ordered some Stripes for some curtains and Im pretty sure Im striping a wall here in the near future. 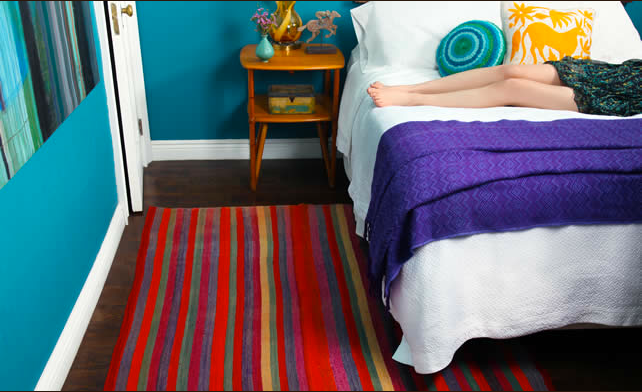 I love all the colors in the second rug! Wanted to comment on your copper lamp...which is in my reader but not here? So please allow me to love your copper lamp on this stripety post. :) Ciao! I keep checking back hoping PhotoBucket has its act together. Thanks for stopping by La Lamp Shade! Those are so fun! I love me some stripes.